I’ve been meaning to post a list of remaining inventory for a while, but haven’t for the same reason I don’t have the Etsy shop going anymore: other things get in the way. Until July 15th, I will only list the items on Etsy if they have been asked for through the blog or an Etsy convo. This will give the folks who have been interested first chance. After July 15th, I will list what I have left for anyone to stumble upon. Originally uploaded by Stellar Babble. Although I had originally planned to merge my fiber efforts and house efforts into one blog, I’ve decided to start a new one instead and keep this one for fiber projects. The new blog is buildingexpectations.wordpress.com if you are interested in following my home improvement efforts. It has been forever since I posted. I’ve decided to start again, but my focus has shifted dramatically from fibers to home repair/renovation. I will post mostly about house stuff, since that is what I seem to be doing the most of, with a few knitting/spinning projects here and there. Revisited a frustrating home improvement project (stripping paint from baseboards and molding) and got a second wind. I have more paint stripping awaiting me right now, but I will make the next post about my first major house project and try to catch up as quickly as possible. I’ve been to a few knitter gatherings around town lately, and finally ran into Kristin of Craft Leftovers.com. I found her site a while back, have chatted with her through Ravelry to get the inside scoop on fiber activities in Ames, and had heard about her from others, but we hadn’t met until a couple weeks ago. At that point, I had just started working on my Etsy shop, had maybe 3 items listed and hadn’t sold anything yet. We were talking about Etsy and she warned us to “Watch out, Etsy is addictive”. I was skeptical at the time, but now I see why. It is such a thrill to get an e-mail in my inbox telling me someone has purchased my creation. It has made me want to make more, make them better, come up with other products and generally spend all my time in my craft workshop. A few sales was all the encouragement I needed to start a full time obsession. In general, I’m as happy as I can remember being in a long time. Even though Scott has to work such long hours and goes back to work after dinner every day, being busy makes being alone a lot less lonely. I’d say I should have started this earlier, but this is the first time we’ve moved in 10 years that we don’t think we’ll be moving again soon. Having time and space to develop something counts for a lot. I’m very thankful for the sales I’ve had so far, and it has driven me to list new items. 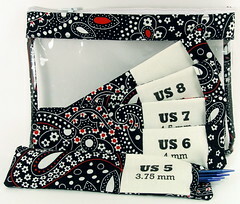 A notions pouch in black, white and red paisley. The Sock Knitter Set which includes 6 dpn holders, cards for recording sock recipients’ foot measurements in a custom holder with grafting instructions on back, a stitch marker holder and a work in progress (WIP) holder. I think I’ll end this rambling post, but heed this as a warning: Etsy Shops are addictive! Well, I have a long way to go before I’ll be comfortable saying I run a business, but I’ve learned a lot already. Taking photos that measure up to the Etsy average has taken a lot of time and learning. I built a collapsible light box from this Instructables tutorial, that has definitely helped, but I could still use better lighting. I’ve read a bunch of articles on Etsy about taking better pictures and have fiddled with my camera until I finally got something decent and then I fixed the white balance some more with Gimp. I’m still learning, but after a couple of photo shoots, I got pictures I was content to use to list new items. Here are a couple examples. As you can see, I got some new fabric (with a gift card from my mom to Crafty Planet in MN) that happens to have a 1 inch pattern that lends itself well to the top edge of the bags. Getting the color right in the photo is still a tricky proposition and the real color is probably somewhere between these two. 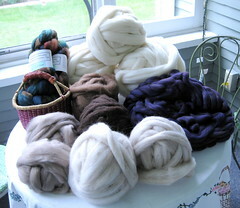 The second item is my latest addition to what I hope to be a set of tools for the serious knitter. 🙂 I have a lot of double pointed needles, and I don’t want to carry them all around, so I use these little individual pouches to just carry what I need. 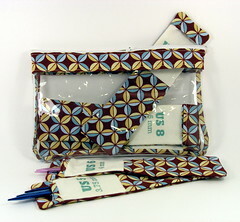 This set is for the mid-range needles, used for hats and sleeves and mittens. 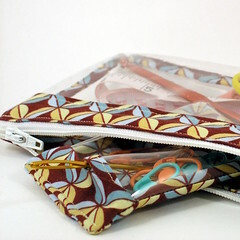 I hope to make a set of smaller pouches for smaller needles some time this week. This is my kind of knitting. I don’t really like doing the same thing over and over, even if socks are small and utilitarian. This book has 8 different sock architectures with master patterns and tables of numbers to help you get the perfect fit. She has different toe and cuff patterns to mix and match, too. I was so excited, I even used Inkscape and MS Word to make these little cards to store people’s measurements. I plan to print a sheet of business cards to carry around and get family foot measurements if they express an interest in wearing hand knit wool socks. Want to use these cards yourself? 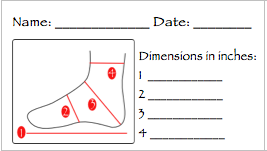 Try downloading the Foot Measurement Cards-corrected pdf for a full page of business cards. I used Avery Business cards with template 8371, but plain paper would do. ETA: My Cut and paste technique had some problems that have been corrected.